Because of the small lesion size, variable anatomical location, and low metabolic rate; conventional imaging of such tumors is often difficult. Computed tomography (CT), ultrasound (US), and magnetic resonance imaging (MRI) are often unable to characterize or sometimes unable to detect such tumors. Therefore, functional imaging plays a crucial role in management of NETs. 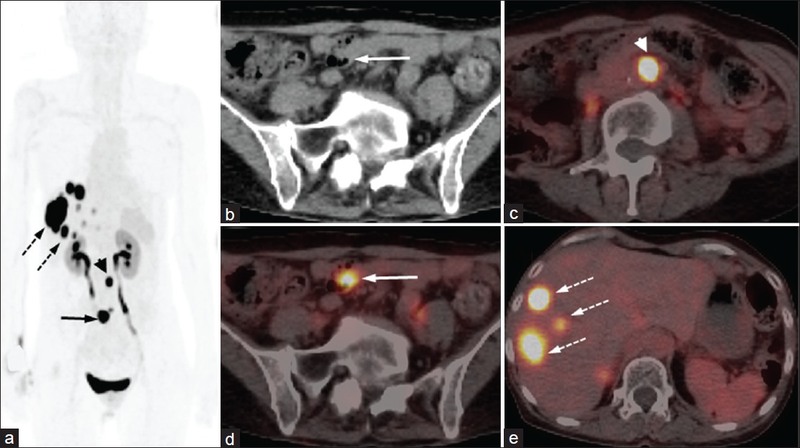 Somatostatin receptor scintigraphy (SRS) is an important tool for imaging of NETs and has been shown to be superior as compared to other morphological imaging modalities, for the detection of both primary NET and their metastatic lesions in a landmark study by Krenning et al., with more than 1,000 patients. A few years back, novel 68 Gallium (68 Ga) labeled somatostatin analogues were developed as positron emission tomography (PET) tracers for NETs and have shown excellent results. In this review we will discuss the methods and implications of PET with these 68 Ga-labeled somatostatin analogues for imaging of NETs and share our experience in this regard [Table 1]. The synthesis process is relatively easy. 68 Ga can be easily eluted from a commercially available 68 Ge/ 68 Ga generator. At our center we have a 30-50 mCi 68 Ge/ 68 Ga generator (Cyclotron Co. Ltd.; Obninsk, Russia). The long half-life of the mother radionuclide 68 Ge (270.8 days) makes it possible to use the generator for approximately 6-12 months depending on use and can be eluted as early as every 3 h.  68 Ga (T 1/2 = 68 min) is a positron emitter with 89% positron emission and negligible gamma emission (3.2%). For labeling, the 68 Ge/ 68 Ga generator is eluted using 0.1 M HCL. The eluent is loaded onto a cation exchange cartridge to preconcentrate and prepurify (using 80% acetone/0.15 M HCL). Purified 68 Ga is then directly eluted with 97.7% acetone/0.05 M HCL into the reaction vial containing 30-50 μg of DOTA-TOC/DOTA-NOC. Synthesis is carried out at approximately 126°C for 10-15 min. This is followed by removal of labeled peptide from unlabeled peptide using reverse phase C-18 column with 400 μl of ethanol. This solution is further diluted with normal saline and passed through 0.22 μm filter to get sterile preparation for injection. Radiolabeling yields of >95% can usually be achieved within 15 min. The radiation exposure to the radiochemist is within limits prescribed. With availability of automated modules the synthesis has become safer. Guidelines are available with respect to PET/CT imaging with 68 Ga-DOTA-peptides. The discontinuation of somatostatin analogue treatment before PET/CT is desired but not mandatory and has been shown not to influence results. Fasting is not required. The recommended dose of 68 Ga-DOTA-peptides is usually 132-222 MBq (4-6 mCi), but should not be less than 100 MBq. PET/CT is acquired 45-60 min post injection, with the general consensus that best images are obtained at 60 min. Images are acquired from skull (must include the pituitary gland) to mid-thigh. Additional views can be taken as and when required. Use of intravenous contrast during CT part of PET/CT is controversial, with few studies advocating their use. At our center we do not routinely use intravenous CT contrast and reserve its use in selected cases. The images are reconstructed using iterative reconstruction using standard protocols. 68 Ga-DOTA peptide PET/CT has been shown to be extremely useful for imaging of GEP-NETs. 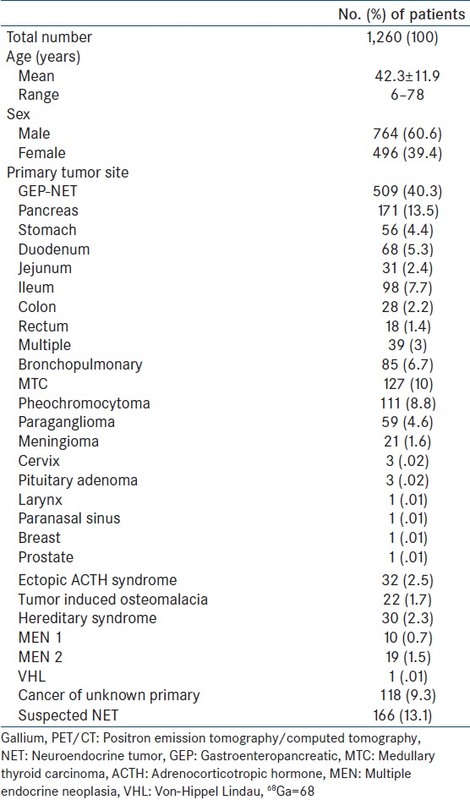 The majority of these tumors contain high number of SSTRs, homogeneously distributed throughout the tumor, and expressed at both primary and metastatic sites. The utility of 68 Ga-DOTA peptide PET/CT is well-established and can influence many aspects of GEP-NET management including staging patients with already diagnosed NETs, detection of sites of recurrence in patients with treated NETs (restaging), diagnosis of patients suspected of having NET based on clinical features or biochemical evidence of hormone excess, selection of potential candidates for cold somatostatin analogue or peptide receptor radionuclide therapy (PRRT), and monitoring response to therapy in such patients. A recent meta-analysis by Treglia et al., evaluated 16 studies comprising 567 patients with GEP and thoracic NETs. The pooled sensitivity and specificity of 68 Ga-DOTA peptide PET or PET/CT in detecting NETs were 93% (95% confidence interval (CI): 91-95%) and 91% (95% CI: 82-97%), respectively, on per patient-based analysis. They advised that this accurate technique should be considered as first-line diagnostic imaging methods in patients with suspicious thoracic and/or GEP NETs. Ambrosini et al., reviewed their experience of imaging GEP-NETs in 1,239 patients. The sensitivity was 92% and specificity was 98% for the detection of NET. The mean SUVmax of positive lesions was 22.8 ± 18.6 (2.2-150.0), reflecting high SSTR expression by GEP-NETs. Our experience has been similar [Figure 2] and [Figure 3]. In a prospective analysis of 109 patients done at our center, 68 Ga-DOTA-NOC PET/CT has shown a sensitivity and specificity of 78.3 and 92.5% for primary tumor and 97.4 and 100% for metastases, respectively. It changed the management strategy in 21 patients (19%) and supported management decisions in 32 patients (29%). It was better than conventional imaging modality for the detection of both primary tumor (P < 0.001) and metastases (P < 0.0001). In that study 68 Ga-DOTA-NOC PET/CT was superior to conventional imaging for the detection of lymph node (P < 0.0001) and bone (P = 0.002), but not liver metastases (P = 1.000). These findings were similar to those reported by Putzer et al. 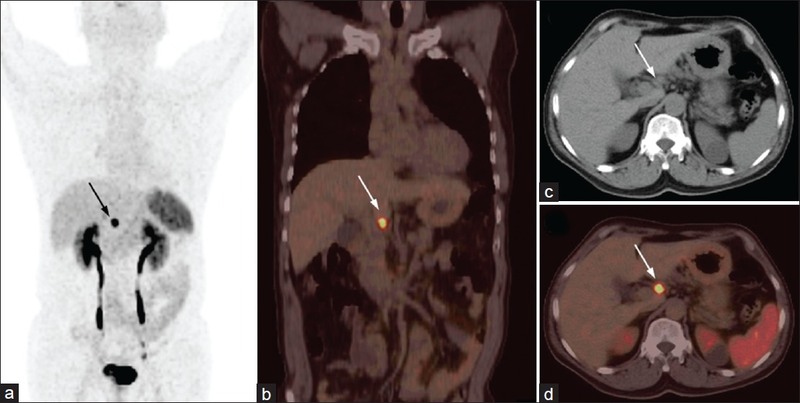 Kumar et al., from our center prospectively compared 68 Ga-DOTA-TOC PET/CT and contrast enhanced CT (CECT) for diagnosis and staging of 20 patients with pancreatic NET. The detection rate of CECT was lower than 68 Ga-DOTA-TOC PET-CT, both for primary tumor (20 vs 15) and metastatic disease (13 vs 7). Another of our studies addressed subgroup of gastrinoma patients with negative or equivocal CECT findings. 68 Ga-DOTA-NOC PET/CT showed a detection rate of 68% overall, 92.8% in those with equivocal CT findings and 36.4% in those with negative CT. Diagnostic performance of 68 Ga-DOTA-NOC PET/CT was superior in patients with equivocal CECT findings than that in patients with negative CECT (P = 0.010). Frilling et al., have also demonstrated the superiority of 68 Ga-DOTA-TOC PET/CT over conventional imaging (CT/MRI) in GEP-NETs. In that series of 52 patients, PET/CT altered the treatment plan in 31 (59.6%) patients. An important subgroup of these patients present with clinical, biochemical, or imaging suspicion of NET. In these patients a histopathological diagnosis of NET is still not available. Given the high sensitivity and specificity of 68 Ga-DOTA-peptide PET/CT in these patients it can be employed to confirm or rule out NET. Ambrosini et al., have shown high sensitivity of 89.5% and specificity of 100% for 68 Ga-DOTA-NOC PET/CT in patients with clinical/biochemical/radiological suspicion of NET. In that population, increased blood markers and clinical signs/symptoms were associated with the lowest frequency of true-positive findings, highlighting that NETs are frequently suspected but rarely diagnosed. On the contrary, a positive radiological finding was more commonly associated with positive 68 Ga-DOTA-NOC PET/CT. The authors concluded that 68 Ga-DOTA-NOC PET/CT in not routinely indicated in patients with clinical/biochemical suspicion of NET. Another similar study by Haug et al., on the contrary, advocated the use of 68 Ga-DOTA-TATE PET/CT in these patients. 68 Ga-DOTA-TATE PET/CT showed a sensitivity of 81% and specificity of 90% in their study. Our experience is similar. We did a retrospective analysis of 164 patients with suspected NET based on clinical/biochemical/imaging findings. In that series 68 Ga-DOTA-NOC PET/CT showed a sensitivity of 94.8% and specificity of 86.5%. The accuracy of PET-CT was 90.4% in patients with clinical signs/symptoms, 86.7% in those with raised biochemical markers, and 92.7% in those with suspicious imaging findings. We must remember the threshold for imaging in patients with suspected NET varies from center to center and hence no definite guideline can be provided at present. However, it appears that in appropriately selected patient population the yield can be high as reported by Haug et al., and our experience. The prognostic ability of 68 Ga-DOTA-peptides PET/CT results from its inverse association with cellular proliferation. As NET becomes more aggressive, it loses its ability of SSTR expression. Campana et al., have demonstrated the prognostic value of SUV on 68 Ga-DOTA-NOC in patients with NET. A SUVmax ≥ 19.3 was found to be a significant predictor of survival on multivariate analysis. Haug et al., on the other hand found change in tumor-to-spleen SUV ratio (ΔSUV T/S) to be an independent predictor of progression free survival after PRRT. In their study, ΔSUV T/S was superior to ΔSUVmax for prediction of outcome. In our analysis of 40 patients with NETs, we found SUVmax on 68 Ga-DOTA-NOC PET/CT and histopathological grades to be significantly associated with progression free survival on multivariate analysis. The SUVmax cutoff obtained in our study was 4, which was less than that reported by Campana et al. Heterogeneity between the patient populations might have caused this difference. Pulmonary NETs are second most common site for NETs after GEP-NETs and account for 22-27% of such tumors. The WHO classification of pulmonary NETs classifies these neoplasms in order of increasing malignant potential into typical carcinoids, atypical carcinoids, and large cell and small cell NETs. Most of these are typical carcinoids with metastases in only 15% and a high 5 year survival rate of over 90%. While typical carcinoids are commonly seen in young adults, the less common atypical carcinoids are more frequent in elderly and are more often associated with metastasis. The differentiation of pulmonary NETs is associated with SSTR expression, with better differentiated tumors showing higher SSTR expression. Many studies in the past have explored 68 Ga-labeled somatostatin analogue PET/CT in patients with pulmonary NETs, often in conjunction with 18 F-FDG. Ambrosini et al., evaluated 68 Ga-DOTA-NOC PET/CT in 11 patients with bronchial carcinoid. PET/CT detected at least one lesion in nine of 11 patients and was negative in two. PET/CT and CECT were discordant in eight of 11 patients. On a clinical basis, PET/CT provided additional information in nine of 11 patients leading to the changes in the clinical management of three of nine patients. Jindal et al., form our center found 68 Ga-DOTA-TOC PET/CT to be very useful for detection of pulmonary carcinoids and commented that it can play an important role in management of such tumors. Kayani et al., compared 68 Ga-DOTATATE and 18 F-FDG PET/CT in 18 patients with pulmonary NET. In that series, typical carcinoids showed significantly higher uptake of 68 Ga-DOTA-TATE and significantly less uptake of 18 F-FDG than did tumors of higher grade (P = 0.002 and 0.005). In addition, 68 Ga-DOTA-TATE was superior to 18 F-FDG for discriminating endobronchial tumor from distal collapsed lung. We at our center found similar results. In a prospective study at our center, the SUVmax in typical carcinoids on 68 Ga-DOTA-TOC-PET/CT was significantly higher (SUVmax, 8.8-66) compared with atypical carcinoids (SUVmax, 1.1-18.5; P = 0.002). It appears that different uptake patterns on 68 Ga-DOTA-TOC PET/CT and 18 F-FDG PET/CT and the ratio of SUVmax may be helpful in differentiating between typical and atypical carcinoids. NETs account for about 2-4% of carcinoma of unknown primary site (CUP) and are often mentioned separately because this entity belongs to a treatable subset. Identification of the primary site is of prime importance as many aspects of tumor management are dependent on it, ranging from disease prognosis, treatment outcome, and survival rates. Morphological imaging, though routinely performed, may not be very useful because of their low sensitivity for NETs. Conventional SRS has been explored to detect occult primary sites in patients with metastatic GEP-NETs with a detection rate of 39%. Prasad et al., were the first to evaluate the role of 68 Ga-DOTA-NOC PET/CT for CUP-NET. They demonstrated that 68 Ga-DOTA-NOC PET-CT was able to localize the primary tumor in 59% of the patients. Moreover, there was change in management in 10% of the patients. The experience from our center is similar [Figure 4]. In a prospective evaluation in 20 patients, we found that 68 Ga-DOTANOC PET-CT was able to localize the primary tumor in 12/20 (60%) patients. The most common site of primary was midgut. Even in patients where no primary tumor was localized, additional sites of metastatic disease were observed when compared to conventional imaging, mostly in lymph nodes and bones. There was a change in management in 3/20 patients (15%), who underwent surgery. In the remaining 17 patients, demonstration of SSTR expression by PET-CT made them suitable candidate for PRRT. Paragangliomas are tumors that develop from endocrine cells derived from pluripotent neural crest stem cells and are associated with neurons of the autonomic nervous system. Those developing from adrenal medulla are most common (~90%) and called pheochromocytoma. Pheochromocytomas are a feature of certain disorders with an autosomal dominant pattern of inheritance (e.g. MEN2) in about one-fourth of unselected cases. They are rare (~1%), but treatable cause of hypertension. About 10-20% of these tumors are malignant. Paragangliomas may also arise anywhere from the sympathetic nervous system or the parasympathetic nervous system. While those arising from sympathetic nervous system (abdominothoracic paraganglioma) are frequently associated with catecholamine overproduction, those arising from parasympathetic system (head and neck paraganglioma) rarely do so. Paragangliomas are familial in 9% cases. They can be multicentric in 10% sporadic cases and 32% of familial cases. Precise localization of these tumors is mandatory for management as surgery is the mainstay of treatment. A wide variety of hereditary syndromes can present with NET. These include MEN syndromes (1 and 2), familial paraganglioma syndrome, von-Hippel Lindau (VHL) syndrome, succinate dehydrogenase (SDH) mutation, and neurofibromatosis type 1. MEN 1 syndrome is the most common and GEP-NETs are often associated. They are usually functional and commonly include gastrinomas (60%) and insulinomas (10%), although carcinoid tumors are also known to occur. MEN2 syndrome on other hand is associated with MTC and pheochromocytoma. As most of these tumors express SSTRs, 68 Ga-DOTA-peptide PET/CT can play an important role in management of these disorders. Froeling et al., evaluated and reported the utility of 68 Ga-DOTA-TOC PET/CT in 21 patients with MEN1 syndrome. PET/CT was superior to contrast CT for detection of NET lesions (P < 0.001) and impacted therapeutic strategy in almost half of the patients. Our experience is similar [Figure 7]. It appears to be especially useful in asymptomatic relatives of index patients. Further evaluation of 68 Ga-DOTA-peptides in these hereditary syndromes is warranted. 68 Ga-DOTA-peptide PET/CT has been shown to be useful for a wide range of other rare tumors of neuroendocrine origin. These include pituitary adenoma, hemangioblastoma, meningioma, melanoma, and others. ,,, It has also been employed for locating the primary tumor in patients with tumor induced osteomalacia and ectopic adrenocorticotropic hormone (ACTH) producing tumors. 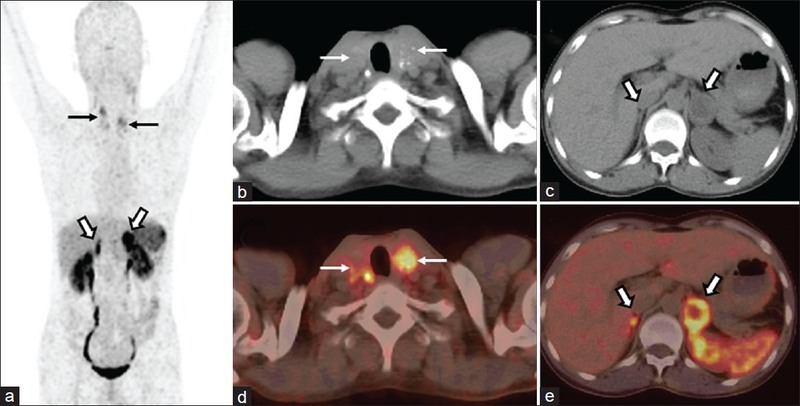 A recent study by Clifton-Bligh et al., have shown the utility of 68 Ga-DOTA-TATE PET/CT imaging in six patients with tumor induced osteomalacia. Our experience is similar, with PET/CT being able to show culprit tumor in a significant proportion of these patients. No systemic study is available regarding utility of 68 Ga-DOTA-peptide PET/CT in ectopic ACTH producing tumor. Results from our center have also not been too encouraging. Only four of our patients (of 32) so far have shown localization (lungs in three patients, pancreas in one). Further studies are required in future addressing these tumors. 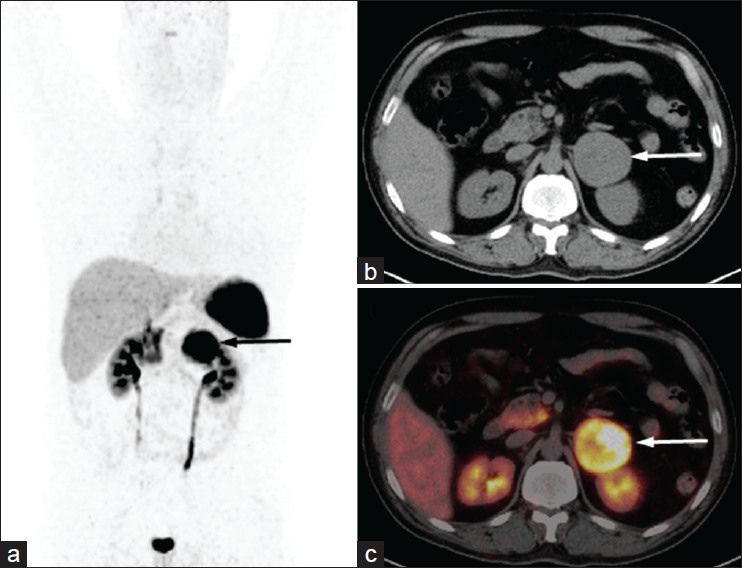 68 Ga-labeled somatostatin analogue PET/CT has emerged as an important imaging tool for NET. It can influence many aspects of management of such tumors and has the potential to be the first-line imaging investigation for their evaluation, especially for GEP-NETs. 1. Yao JC, Hassan M, Phan A, Dagohoy C, Leary C, Mares JE, et0 al. One hundred years after "carcinoid": Epidemiology of and prognostic factors for neuroendocrine tumors in 35,825 cases in the United States. J Clin Oncol 2008;26:3063-72. 2. Kaltsas GA, Besser GM, Grossman AB. The diagnosis and medical management of advanced neuroendocrine tumors. Endocr Rev 2004;25:458-511. 3. Jensen RT. Endocrine tumors of the gastrointestinal tract and pancreas. In: Kasper DL, Braunwald E, Fauci AS, Hauser SL, Longo DL, Jameson JL, editors. Harrison's Principles of Internal Medicine. 16 th ed. New York: McGraw-Hill; 2005. p. 2220-31. 4. Klimstra DS, Modlin IR, Coppola D, Lloyd RV, Suster S. The pathologic classification of neuroendocrine tumors: A review of nomenclature, grading, and staging systems. Pancreas 2010;39:707-12. 5. Ramage JK, Davies AH, Ardill J, Bax N, Caplin M, Grossman A, et al. Guidelines for the management of gastroenteropancreatic neuroendocrine (including carcinoid) tumors. Gut 2005;54 Suppl 4:iv1-16. 6. Krenning EP, Kwekkeboom DJ, Bakker WH, Breeman WA, Kooij PP, Oei HY, et al. Somatostatin receptor scintigraphy with [111In- DTPA-D-Phe1]- and [123I-Tyr3]-octreotide: The Rotterdam experience with more than 1000 patients. Eur J Nucl Med 1993;20:716-31. 7. Cescato R, Schulz S, Waser B, Eltschinger V, Rivier JE, Wester HJ, et al. Internalization of sst2, sst3, and sst5 receptors: Effects of somatostatin agonists and antagonists. J Nucl Med 2006;47:502-11. 8. Antunes P, Ginj M, Zhang H, Waser B, Baum RP, Reubi JC, et al. Are radiogallium-labelled DOTA-conjugated somatostatin analogues superior to those labelled with other radiometals? Eur J Nucl Med Mol Imaging 2007;34:982-93. 9. Wild D, Mäcke HR, Waser B, Reubi JC, Ginj M, Rasch H, et al. 68Ga-DOTANOC: A first compound for PET imaging with high affinity for somatostatin receptor subtypes 2 and 5. Eur J Nucl Med Mol Imaging 2005;32:724. 10. Kabasakal L, Demirci E, Ocak M, Decristoforo C, Araman A, Ozsoy Y, et al. Comparison of 68 Ga-DOTATATE and 68 Ga-DOTANOC PET/CT imaging in the same patient group with neuroendocrine tumors. Eur J Nucl Med Mol Imaging 2012;39:1271-7. 11. Gabriel M, Decristoforo C, Kendler D, Dobrozemsky G, Heute D, Uprimny C, et al. [68Ga] DOTA-Tyr3-octreotide PET in neuroendocrine tumors: Comparison with somatostatin receptor scintigraphy and CT. J Nucl Med 2007;48:508-18. 12. Kowalski J, Henze M, Schuhmacher J, Mäcke HR, Hofmann M, Haberkorn U. Evaluation of positron emission tomography imaging using [68Ga]-DOTA-D Phe (1)-Tyr (3)-octreotide in comparison to [111In]-DTPAOC SPECT. First results in patients with neuroendocrine tumors. Mol Imaging Biol 2003;5:42-8. 13. Haug AR, Auernhammer CJ, Wängler B, Schmidt GP, Uebleis C, Göke B, et al. 68Ga-DOTATATE PET/CT for the early prediction of response to somatostatin receptor-mediated radionuclide therapy in patients with well-differentiated neuroendocrine tumors. J Nucl Med 2010;51:1349-56. 14. Campana D, Ambrosini V, Pezzilli R, Fanti S, Labate AM, Santini D, et al. Standardized uptake values of (68) Ga-DOTANOC PET: A promising prognostic tool in neuroendocrine tumors. J Nucl Med 2010;51:353-9. 15. Zhernosekov KP, Filosofov DV, Baum RP, Aschoff P, Bihl H, Razbash AA, et al. Processing of generator-produced 68Ga for medical application. J Nucl Med 2007;48:1741-8. 16. Dwivedi DK, Snehlata, Dwivedi AK, Lochab SP, Kumar R, Naswa N, et al. Radiation exposure to nuclear medicine personnel handling positron emitters from Ge-68/Ga-68 generator. Indian J Nucl Med 2011;26:86-90. 17. Virgolini I, Ambrosini V, Bomanji JB, Baum RP, Fanti S, Gabriel M, et al. Procedure guidelines for PET/CT tumor imaging with 68Ga-DOTA-conjugated peptides: 68Ga-DOTA-TOC, 68Ga- DOTA-NOC, 68Ga-DOTA-TATE. Eur J Nucl Med Mol Imaging 2010;37:2004-10. 18. Haug AR, Rominger A, Mustafa M, Auernhammer C, Göke B, Schmidt GP, et al. Treatment with octreotide does not reduce tumor uptake of 68Ga-DOTATATE as measured by PET/CT in patients with neuroendocrine tumors. J Nucl Med 2011;52:1679-83. 19. Ruf J, Schiefer J, Furth C, Kosiek O, Kropf S, Heuck F, et al. 68Ga-DOTATOC PET/CT of neuroendocrine tumors: Spotlight on the CT phases of a triple-phase protocol. J Nucl Med 2011;52:697-704. 20. Boy C, Heusner TA, Poeppel TD, Redmann-Bischofs A, Unger N, Jentzen W, et al. 68 Ga-DOTATOC PET/CT and somatostatin receptor (sst1-sst5) expression in normal human tissue: Correlation of sst2 mRNA and SUVmax. Eur J Nucl Med Mol Imaging 2011;38:1224-36. 21. Castellucci P, Pou Ucha J, Fuccio C, Rubello D, Ambrosini V, Montini GC, et al. Incidence of increased 68Ga-DOTANOC uptake in the pancreatic head in a large series of extrapancreatic NET patients studied with sequential PET/CT. J Nucl Med 2011;52:886-90. 22. Al-Ibraheem A, Bundschuh RA, Notni J, Buck A, Winter A, Wester HJ, et al. Focal uptake of 68Ga-DOTATOC in the pancreas: Pathological or physiological correlate in patients with neuroendocrine tumors? Eur J Nucl Med Mol Imaging 2011;38:2005-13. 23. Eberlein U, Lassmann M. Dosimetry of [(68) Ga]-labeled compounds. Appl Radiat Isot 2012. 24. Reubi JC, Kvols L, Krenning E, Lamberts SW. In vitro and in vivo detection of somatostatin receptors in human malignant tissues. Acta Oncol 1991;30:463-8. 25. Treglia G, Castaldi P, Rindi G, Giordano A, Rufini V. Diagnostic performance of Gallium-68 somatostatin receptor PET and PET/CT in patients with thoracic and Gastroenteropancreatic neuroendocrine tumors: A meta-analysis. Endocrine 2012;42:80-7. 26. Ambrosini V, Campana D, Tomassetti P, Fanti S. 68Ga-labelled peptides for diagnosis of gastroenteropancreatic NET. Eur J Nucl Med Mol Imaging 2012;39:Suppl 1:S52-60. 27. Naswa N, Sharma P, Kumar A, Nazar AH, Kumar R, Chumber S, et al. Gallium-68-DOTA-NOC PET/CT of patients with gastroenteropancreatic neuroendocrine tumors: A prospective single-center study. AJR Am J Roentgenol 2011;197:1221-8. 28. Putzer D, Gabriel M, Henninger B, Kendler D, Uprimny D, Dobrozemsky G, et al. Bone metastases in patients with neuroendocrine tumor: 68Ga-DOTA-Tyr3-octreotide PET in comparison to CT and bone scintigraphy. J Nucl Med 2009;50:1214-21. 29. Kumar R, Sharma P, Garg P, Karunanithi S, Naswa N, Sharma R, et al. Role of (68) Ga-DOTATOC PET-CT in the diagnosis and staging of pancreatic neuroendocrine tumors. Eur Radiol 2011;21:2408-16. 30. Naswa N, Sharma P, Soundararajan R, Karunanithi S, Nazar AH, Kumar R, et al. Diagnostic performance of somatostatin receptor PET/CT using (68) Ga-DOTANOC in gastrinoma patients with negative or equivocal CT findings. Abdom Imaging 2012;38:552-60. 31. Frilling A, Sotiropoulos GC, Radtke A, Malago M, Bockisch A, Kuehl H, et al. The impact of 68Ga-DOTATOC positron emission tomography/computed tomography on the multimodal management of patients with neuroendocrine tumors. Ann Surg. 2010;252:850-6. 32. Ambrosini V, Campana D, Nanni C, Cambioli S, Tomassetti P, Rubello D, et al. Is 68Ga-DOTA-NOC PET/CT indicated in patients with clinical, biochemical or radiological suspicion of neuroendocrine tumor? Eur J Nucl Med Mol Imaging 2012;39:1278-83. 33. Haug AR, Cindea-Drimus R, Auernhammer CJ, Reincke M, Wängler B, Uebleis C, et al. 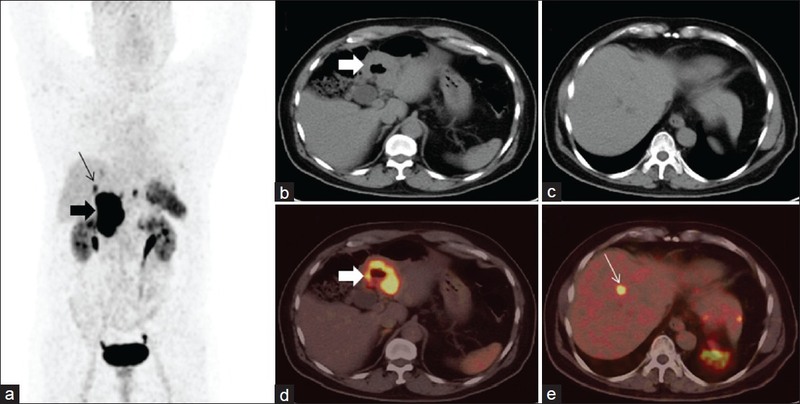 The Role of 68Ga-DOTATATE PET/CT in suspected neuroendocrine tumors. J Nucl Med 2012;53:1686-92. 34. Miederer M, Seidl S, Buck A, Scheidhauer K, Wester HJ, Schwaiger M, et al. Correlation of immunohistopathological expression of somatostatin receptor 2 with standardised uptake values in 68Ga-DOTATOC PET/CT. Eur J Nucl Med Mol Imaging 2009;36:48-52. 35. Ezziddin S, Logvinski T, Yong-Hing C, Ahmadzadehfar H, Fischer HP, Palmedo H, et al. Factors predicting tracer uptake in somatostatin receptor and MIBG scintigraphy of metastatic gastroenteropancreatic neuroendocrine tumors. J Nucl Med 2006;47:223-33. 36. Rindi G, Villanacci V, Ubiali A. Biological and molecular aspects of gastroenteropancreatic neuroendocrine tumors. Digestion 2000;62:19-26. 37. Adams S, Baum R, Rink T, Schumm-Dräger PM, Usadel KH, Hör G. Limited value of fluorine-18 fluorodeoxyglucose positron emission tomography for the imaging of neuroendocrine tumors. Eur J Nucl Med 1998;25:79-83. 38. Gabriel M, Oberauer A, Dobrozemsky G, Decristoforo C, Putzer D, Kendler D, et al. 68Ga-DOTA-Tyr3-octreotide PET for assessing response to somatostatin-receptor-mediated radionuclide therapy. J Nucl Med 2009;50:1427-34. 39. Kimura N, Miura W, Noshiro T, Miura Y, Ookuma Y, Nagura H. Ki-67 is an indicator of progression of neuroendocrine tumors. Endocr Pathol 1994;5:223-8. 40. Brambilla E, Travis WD, Colby TV, Corrin B, Shimosato Y. The new World Health Organization classification of lung tumors. Eur Respir J 2001;18:1059-68. 41. Morandi U, Casali C, Rossi G. Bronchial typical carcinoid tumors. Semin Thorac Cardiovasc Surg 2006;18:191-8. 42. Srirajaskanthan R, Toumpanakis C, Karpathakis A, Marelli L, Quigley AM, Dusmet M, et al. Surgical management and palliative treatment in bronchial neuroendocrine tumors: A clinical study of 45 patients. Lung Cancer 2009;65:68-73. 43. Belhocine T, Foidart J, Rigo P, Najjar F, Thiry A, Quatresooz P, et al. Fluorodeoxyglucose positron emission tomography and somatostatin receptor scintigraphy for diagnosing and staging carcinoid tumors: Correlations with the pathological indexes p53 and Ki-67. Nucl Med Commun 2002;23:727-34. 44. Ambrosini V, Castellucci P, Rubello D, Nanni C, Musto A, Allegri V, et al. 68Ga-DOTA-NOC: A new PET tracer for evaluating patients with bronchial carcinoid. Nucl Med Commun 2009;30:281-6. 45. Jindal T, Kumar A, Venkitaraman B, Dutta R, Kumar R. Role of (68) Ga-DOTATOC PET/CT in the evaluation of primary pulmonary carcinoids. Korean J Intern Med 2010;25:386-91. 46. Kayani I, Conry BG, Groves AM, Win T, Dickson J, Caplin M, et al. A comparison of 68Ga-DOTATATE and 18F-FDG PET/CT in pulmonary neuroendocrine tumors. J Nucl Med 2009;50:1927-32. 47. Jindal T, Kumar A, Venkitaraman B, Meena M, Kumar R, Malhotra A, et al. Evaluation of the role of [18F] FDG-PET/CT and [68Ga] DOTATOC-PET/CT in differentiating typical and atypical pulmonary carcinoids. Cancer Imaging 2011;15:70-5. 48. Hainsworth JD, Spigel DR, Litchy S, Greco FA. Phase II trial of paclitaxel, carboplatin, and etoposide in advanced poorly differentiated neuro-endocrine carcinoma: A Minnie Pearl Cancer Research Network Study. J Clin Oncol 2006;24:3548-54. 49. Savelli G, Lucignani G, Seregni E, Marchianò A, Serafini G, Aliberti G, et al. Feasibility of somatostatin receptor scintigraphy in the detection of occult primary gastro-entero-pancreatic (GEP) neuroendocrine tumors. Nucl Med Commun 2004;25:445-9. 50. Prasad V, Ambrosini V, Hommann M, Hoersch D, Fanti S, Baum RP. Detection of unknown primary neuroendocrine tumors (CUP-NET) using 68Ga-DOTANOC receptor PET-CT. Eur J Nucl Med Mol Imaging 2010;37:67-77. 51. Naswa N, Sharma P, Kumar A, Soundararajan R, Kumar R, Malhotra A, et al. 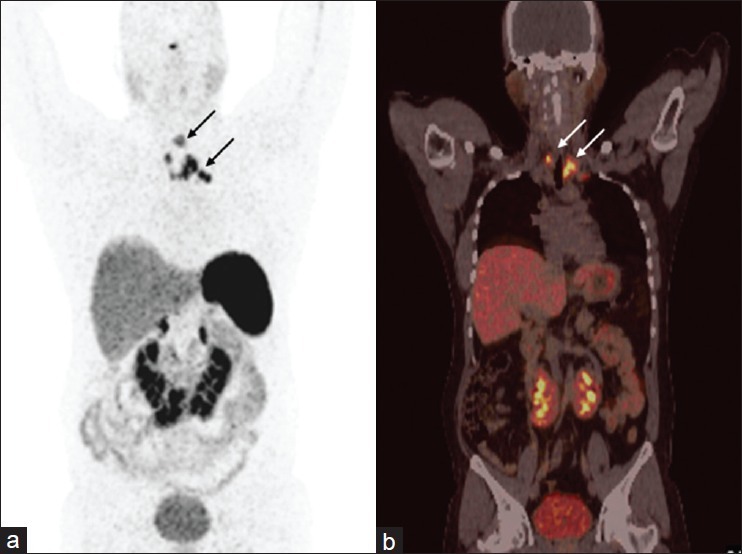 68 Ga-DOTANOC PET/CT in patients with carcinoma of unknown primary of neuroendocrine origin. Clin Nucl Med 2012;37:245-51. 52. Leboulleux S, Baudin E, Travagli JP, Schlumberger M. Medullary thyroid carcinoma. Clin Endocrinol (Oxf) 2004;61:299-310. 53. Dralle H, Damm I, Scheumann GF, Kotzerke J, Kupsch E. Frequency and significance of cervicomediastinal lymph node metastases in medullary thyroid carcinoma: Results of a compartment-oriented microdissection method. Henry Ford Hosp Med J 1992;40:264-7. 54. Bergholm U, Adami HO, Bergstrom R, Johansson H, Lundell G, Telenius-Berg M, et al. Clinical characteristics in sporadic and familial medullary thyroid carcinoma: A nationwide study of 249 patients in Sweden from 1959 through 1981. Cancer 1989;63:1196-204. 55. Scollo C, Baudin E, Travagli JP, Caillou B, Bellon N, Leboulleux S, et al. Rationale for central and bilateral lymph node dissection in sporadic and hereditary medullary thyroid cancer. J Clin Endocrinol Metab 2003;88:2070-5. 56. DeLellis RA, Rule AH, Spiler I, Nathanson L, Tashjian AH Jr, Wolfe HJ. Calcitonin and carcinoembryonic antigen as tumor markers in medullary thyroid carcinoma. Am J Clin Pathol 1978;70:587-94. 57. Ugur O, Kostakğlu L, Güler N, Caner B, Uysal U, Elahi N, et al. Comparison of 99mTc (V)-DMSA, 201Tl and 99mTc-MIBI imaging in the follow-up of patients with medullary carcinoma of the thyroid. Eur J Nucl Med 1996;23:1367-71. 58. Gao Z, Biersack H, Ezziddin S, Logvinski T, An R. The role of combined imaging in metastatic medullary thyroid carcinoma: 111In-DTPA-octreotide and 131I/123I-MIBG as predictors for radionuclide therapy. J Cancer Res Clin Oncol 2004;130:649-56. 59. Cheng X, Bao L, Xu Z, Li D, Wang J, Li Y. 18 F-FDG-PET and 18 F-FDG-PET/CT in the detection of recurrent or metastatic medullary thyroid carcinoma: A systematic review and meta-analysis. J Med Imaging Radiat Oncol 2012;56:136-42. 60. Zatelli MC, Piccin D, Tagliati F, Bottoni A, Luchin A, Vignali C, et al. Selective activation of somatostatin receptor subtypes differentially modulates secretion and viability in human medullary thyroid carcinoma primary cultures: Potential clinical perspectives. J Clin Endocrinol Metab 2006;91:2218-24. 61. Baudin E, Lumbroso J, Schlumberger M, Leclere J, Giammarile F, Gardet P, et al. Comparison of octreotide scintigraphy and conventional imaging in medullary thyroid carcinoma. J Nucl Med 1996;37:912-6. 62. Conry BG, Papathanasiou ND, Prakash V, Kayani I, Caplin M, Mahmood S, et al. Comparison of (68) Ga-DOTATATE and (18) F-fluorodeoxyglucose PET/CT in the detection of recurrent medullary thyroid carcinoma. Eur J Nucl Med Mol Imaging 2010;37:49-57. 63. Naswa N, Sharma P, Suman Kc S, Lata S, Kumar R, Malhotra A, et al. Prospective evaluation of 68Ga-DOTA-NOC PET-CT in patients with recurrent medullary thyroid carcinoma: Comparison with 18F-FDG PET-CT. Nucl Med Commun 2012;33:766-74. 64. Gifford RW Jr, Manger WM, Bravo EL. Pheochromocytoma. Endocrinol Metab Clin North Am 1994;23:387-404. 65. Neumann HP, Berger DP, Sigmund G, Blum U, Schmidt D, Parmer RJ, et al. Pheochromocytomas, multiple endocrine neoplasia type 2, and von Hippel-Lindau disease. N Engl J Med 1993;329:1531-8. 66. Hinerman RW, Amdur RJ, Morris CG, Kirwan J, Mendenhall WM. Definitive radiotherapy in the management of paragangliomas arising in the head and neck: A 35- year experience. Head Neck 2008;30:1431-8. 67. Grufferman S, Gillman MW, Pasternak LR, Peterson CL, Young WG Jr. Familial carotid body tumors: Case report and epidemiologic review. Cancer 1980;46:2116-22. 68. Kliewer KE, Wen DR, Cancilla PA, Cochran AJ. Paragangliomas: Assessment of prognosis by histologic, immunohistochemical, and ultrastructural techniques. Hum Pathol 1989;20:29-39. 69. Kudva YC, Sawka AM, Young WF Jr. Clinical review 164: The laboratory diagnosis of adrenal pheochromocytoma: The Mayo Clinic experience. J Clin Endocrinol Metab 2003;88:4533-9. 70. Khafagi FA, Shapiro B, Fig LM, Mallette S, Sisson JC. Labetalol reduces 131I MIBG uptake by pheochromocytoma and normal tissues. J Nucl Med 1989;30:481-9. 71. Ueberberg B, Tourne H, Redmann A, Walz MK, Schmid KW, Mann K, et al. Differential expression of the human somatostatin receptor subtypes sst1 to sst5 in various adrenal tumors and normal adrenal gland. Horm Metab Res 2005;37:722-8. 72. van der Harst E, de Herder WW, Bruining HA, Bonjer HJ, de Krijger RR, Lamberts SW, et al. (123) I metaiodobenzylguanidine and (111) In octreotide uptake in begnign and malignant pheochromocytomas. J Clin Endocrinol Metab 2001;86:685-93. 73. Win Z, Al-Nahhas A, Towey D, Todd JF, Rubello D, Lewington V. 68Ga-DOTATATE PET in neuroectodermal tumors: First experience. Nucl Med Commun 2007;28:359-63. 74. Maurice JB, Troke R, Win Z, Ramachandran R, Al-Nahhas A, Naji M, et al. A comparison of the performance of 68 Ga-DOTATATE PET/CT and ¹²≥I-MIBG SPECT in the diagnosis and follow-up of phaeochromocytoma and paraganglioma. Eur J Nucl Med Mol Imaging 2012;39:1266-70. 75. Naswa N, Sharma P, Nazar AH, Agarwal KK, Kumar R, Ammini AC, et al. Prospective evaluation of 68 Ga-DOTA-NOC PET-CT in phaeochromocytoma and paraganglioma: Preliminary results from a single centre study. Eur Radiol 2012;22:710-9. 76. Naswa N, Sharma P, Soundararajan R, Patnecha M, Lata S, Kumar R, et al. Pre-operative characterisation of indeterminate large adrenal masses with dual tracer PET-CT using 18F FDG and 68Ga-DOTANOC: Initial results. Diagn Interv Radiol 2012;19:294-8. 77. Naswa N, Kumar A, Sharma P, Bal C, Malhotra A, Kumar R. Imaging carotid body chemodectomas with 68 Ga-DOTA-NOC PET-CT. Br J Radiol 2012;85:1140-5. 78. Sharma P, Thakar A, Suman KCS, Dhull VS, Singh H, Naswa N, et al. 68Ga-DOTANOC PET-CT for baseline evaluation of patients with head and neck paraganglioma. J Nucl Med 2013;54:841-7. 79. Taïeb D, Neumann H, Rubello D, Al-Nahhas A, Guillet B, Hindié E. Modern nuclear imaging for paragangliomas: Beyond SPECT. J Nucl Med 2012;53:264-74. 80. Thakker RV. Multiple endocrine neoplasia type 1. In: De Groot LJ, Jameson JL, editors Endocrinology, 4 th ed. Philadelphia: Saunders; 2000. p. 2503-17. 81. Wohllk N, Schweizer H, Erlic Z, Schmid KW, Walz MK, Raue F, et al. Multiple endocrine neoplasia type 2. Best Pract Res Clin Endocrinol Metab 2010;24:371-87. 82. Froeling V, Elgeti F, Maurer MH, Scheurig-Muenkler C, Beck A, Kroencke TJ, et al. Impact of Ga-68 DOTATOC PET/CT on the diagnosis and treatment of patients with multiple endocrine neoplasia. Ann Nucl Med 2012;26:738-43. 83. 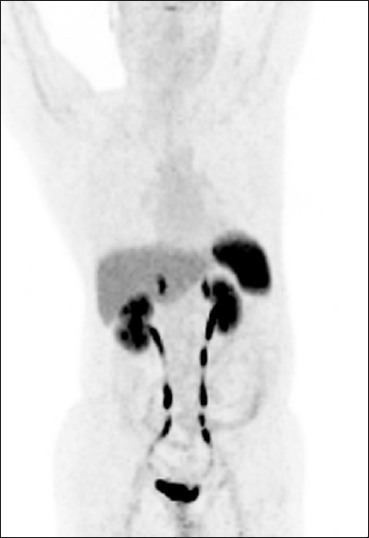 Naswa N, Das CJ, Sharma P, Karunanithi S, Bal C, Kumar R. Ectopic pituitary adenoma with empty sella in the setting of MEN-1 syndrome: Detection with 68Ga-DOTANOC PET/CT. Jpn J Radiol 2012;30:783-6. 84. Ambrosini V, Campana D, Allegri V, Opocher G, Fanti S. 68Ga-DOTA-NOC PET/CT detects somatostatin receptors expression in von hippel-lindau cerebellar disease. Clin Nucl Med 2011;36:64-5. 85. Afshar-Oromieh A, Giesel FL, Linhart HG, Haberkorn U, Haufe S, Combs SE, et al. Detection of cranial meningiomas: Comparison of 68 Ga-DOTATOC PET/CT and contrast-enhanced MRI. Eur J Nucl Med Mol Imaging 2012;39:1409-15. 86. Brogsitter C, Zöphel K, Wunderlich G, Kämmerer E, Stein A, Kotzerke J. Comparison between F-18 fluorodeoxyglucose and Ga-68 DOTATOC in metastasized melanoma. Nucl Med Commun 2013;34:47-9. 87. Clifton-Bligh RJ, Hofman MS, Duncan E, Sim IeW, Darnell D, Clarkson A, et al. Improving diagnosis of tumor-induced osteomalacia with gallium-68 DOTATATE PET/CT. J Clin Endocrinol Metab 2013;98:687-94.